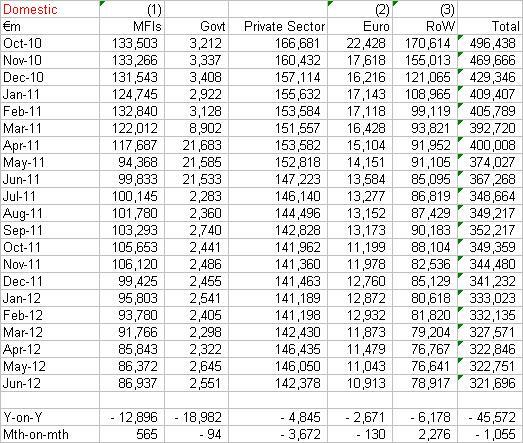 The CBI doesn’t provide an analysis of private sector deposits at the covered banks – about the only analysis it doesn’t provide – but in terms of all banks operating in Ireland including foreign and IFSC banks, Irish household deposits increased by €103m in June, which brings such deposits to €92.1bn, the same as the June 2011 level. 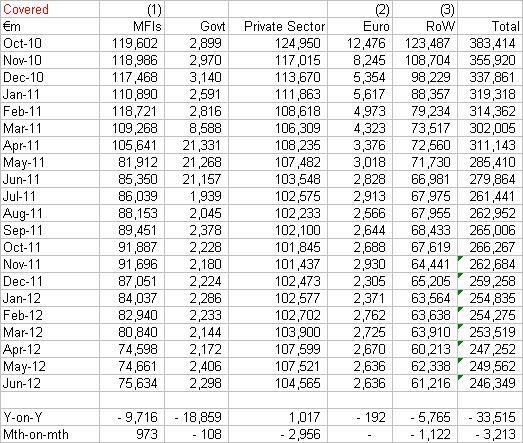 Total deposits from all sources in all Irish banks increased by €0.3bn in June.. Although the Department of Finance appears to have published its “Deposits Trends” series for June 2012, it isn’t yet available from the Department’s website, but the excellent Daily Business Post has reported that it will show retail deposits at Irish banks increased by €600m in June 2012 to now stand at €153bn, well above the floor reached last year. 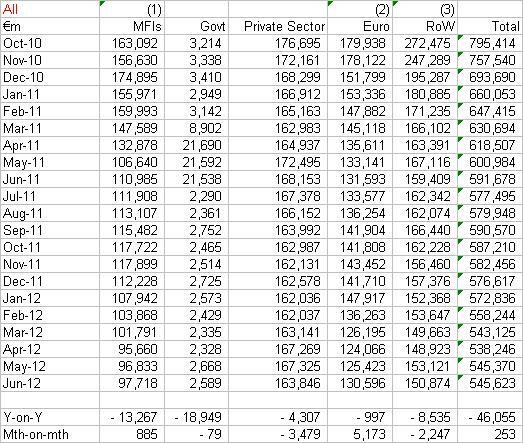 These figures include deposits at overseas operations of Irish banks eg the Bank of Ireland/Post Office joint venture in the UK. However the Department does say that one half of the increase in the month is from deposits at Irish branches. But the bouquet is positive, and should be welcomed as good news. Here is the full set of deposit statistics for the different categories of bank operating in Ireland. First up is the consolidated picture for all banks operating in Ireland including those 450-banks based in the IFSC which do not service the domestic economy. This morning in Dublin’s High Court, Ms Justice Finlay Geoghegan dismissed Treasury Holdings’ application for a judicial review of NAMA’s dealings with its €1.7bn of loans. It is hoped the judgment will be available shortly and will be posted here as an update, but immediate reporting by Mary Carolan at the Irish Times suggests that the key point in the case was the offer made by Treasury in January 2012 of not pursuing a case through the courts with NAMA on condition that NAMA enter into a standstill agreement to allow for the examination of third party offers for Treasury’s loans. The judge appears to have held that Treasury was in fact entitled to be consulted before NAMA took action. So although this might be a NAMA victory, I don’t think the Agency will be jubilant. No word yet from Treasury as to any appeal, but you might recall that in a previous NAMA court case, the developer Paddy McKillen lost comprehensively at the High Court but then went on to secure a draw at the Supreme Court, which reversed some of the lower court’s judgment. Treasury had to offer up unencumbered assets as security for costs in this case, and it won’t have been a cheap undertaking, with little change on NAMA’s side out of €1m I would have said. The judicial review hearing was preceded by a Treasury offer to NAMA to enter into mediation, to which there was no apparent response from NAMA. Treasury then sponsored a Peter Bacon review of the Irish economy featuring NAMA. And NAMA hasn’t relented on its pursuit of the Treasury founders, the colourful Johnny Ronan and understated Richard Barrett, with fresh applications last month seeking €3m from each pursuant to personal guarantees. UPDATE (1): 31st July, 2012. 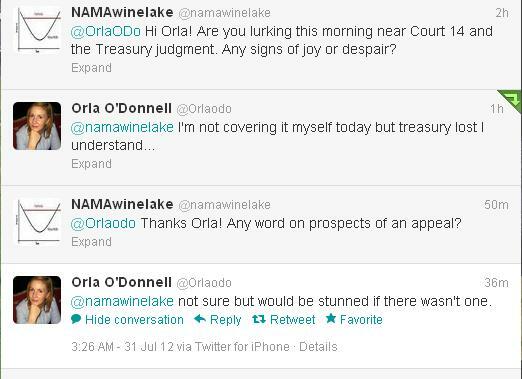 Still awaiting judgment and Treasury/NAMA reactions to the judgment, but RTE’s seasoned Legal Correspondent, Orla O’Donnell gives her (more than) tuppence worth here on prospects for an appeal by Treasury. UPDATE (3): 31st July, 2012. The judgment is now online here. UPDATE (4): 31st July, 2012. Treasury has now issued a statement, available here, in which it confirms it “will now mount an appeal” – the statement pulls out the positives from the judgment, the right to be consulted, the obligation on NAMA to consider proposals and the unfair procedure of NAMA having a meeting on 6th December 2011 where it apparently committed to a course of action before Treasury had submitted its “final” plan. UPDATE (5): 31st July, 2012. Extracts from the judgement from Judge Finlay Geoghegan, although Treasury has lost this battle, NAMA may have suffered serious damage to its abilities generally in the war. Having now studied this judgment, it looks like a pyrrhic victory for NAMA in that it has escaped with its skin – just about – in this specific instance with Treasury Holdings because of the commitment given by Treasury not to pursue legal action in return for NAMA granting a standstill period to allow for the examination of third party bids for Treasury’s loans. BUT the Judge has seemingly opened the floodgates for legal action by any developer whose loans have been enforced. There are specific facts that apply in the Treasury case that mightn’t apply elsewhere, but it doesn’t seem on here that these are narrow, esoteric or highly unusual facts. Ray and Danny Grehan are probably studying this judgment closely! In other words, every single decision taken by NAMA to enforce is amenable to judicial review. 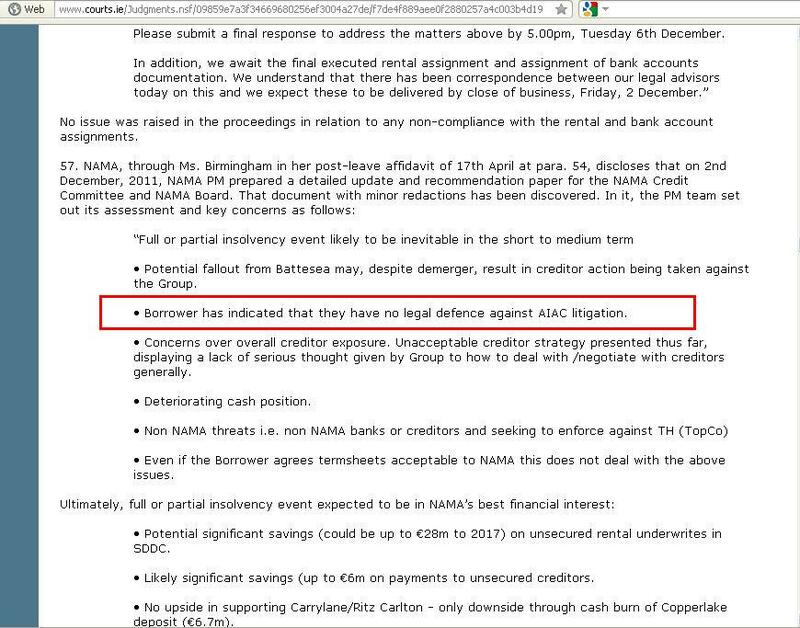 And in the circumstances of Treasury’s loans, the Judge pours more oil on the fire by judging that Treasury had a right to be heard before NAMA appointed receivers. The Judge also concludes that NAMA’s actions weren’t fair in that Treasury didn’t have an opportunity to make representations to NAMA, eg to present third party investment proposals. This may not be a good day for Treasury, but it’s a pretty dreadful day for NAMA also. UPDATE: 1st August, 2012. The judgment makes for intriguing reading and refers to a NAMA claim that litigation with which Treasury is presumably involved, with an entity designated “AIAC”, is set to fail. An unusual inclusion in a court judgment, reproduced below.